This time last week, the Phillies were 4-8 and it felt like we were potentially looking at a long season. Not technically any longer than a winning season, mind you. Just the kind of losing season that drags on longer than anyone wants, hanging around like the last party guest who would rather show you funny YouTube videos than take a hint. Even when it’s mid-August and the word “relevant” is only used with a preceding “not at all” to describe the state of the Phillies, there are still games to play. The pointlessness of the exercise makes it feel as though we are gazing deeply into the eyes of infinity. Given that only two weeks had passed, it might seem early to drop such a hot take on a team’s outlook. To that point, I agree – it’s easy to overreact to a small sample when it’s the only sample we have. The Phillies rejected my dreary outlook of them this week, going 5-1 to even up their record at .500. This isn’t a mirage, either – their pythagorean record (which looks at run differential to strip out some of the randomness of sequencing hits) and BaseRuns record (which goes a step further to strip out sequencing by looking at offensive events rather than runs scored) agree that this team is playing .500 baseball. Well done, Phillies. Game 13: Win, 6-2. After getting swept at home by the Mets, the Phillies headed up to New York to take them on on their own turf. This would have been Clay Buchholz’s turn in the rotation, but his injury might spell the end of his career in Philadelphia. This injury is worst case scenario for the Phillies – they are on the hook for the rest of his $13.5 million, and he neither can pitch well enough to be traded for a prospect or poorly enough to help the Phillies draft position. Sometimes you think there are two doors in front of you to choose from, only for there to be a trap door underneath that opens up and sends you hurtling toward a pile of wasted money. The silver lining is that Eflin returned to the bigs, and his 2017 debut more closely resembled “Good Eflin” than “Bad” – 5 IP, 4 K, 3 BB, 2 ER, 1 wild pitch, and 0 people that realized I was counting down. Runs were hard to come by for either side, with the Phillies held scoreless until late in the game. The Phillies were down 0-2 with nobody on base and 2 outs in the 8th inning – the Mets win probability was a commanding 85.1%. A walk by Cameron Rupp offered glimmers of hope, but it was a flukey fielding error by Jose Reyes that almost entirely handed the game to the Phillies. The Phillies went on to score 2 in the inning kept alive by the error, tying the game and later forcing extras. 4 runs in the 10th sealed the deal, but the real heroes were the bullpen, who combined to hurl 5 scoreless innings. Hey guys! You did a good! Game 14: Loss, 4-5. Jay Bruce hit two home runs and knocked in all 5 of the runs for the Mets. That brought Bruce’s season HR total to 6, and his season home run total against the Phillies to 4. When he makes his money this offseason, he better send the Phillies a fruit basket and a thank you card. The usually inefficient Velasquez managed to finish 6 innings in his third start of the season, but was unable to match quantity with quality as he allowed 3 runs and only struck out 2. Every start this season, Velasquez has grown slightly more economical with his pitches, going one inning deeper into the game each go around, but reducing his K/9 by about 9. If the pattern holds, then in Tuesday’s highly hyped “The Battle for 2nd in the East” game against the Marlins, he will go 7 strong and strike out -5. Game 15: Win, 6-4. Maikel Franco snapped a 23 PA hitless streak (albeit with 1 walk) in a big way, smashing a double and a homer to help lead the Phillies to an improbable victory over Thor (on his very own Thorsday, at that). Aaron Nola gutted out 5 innings and was missing his usual pinpoint control. If striking out fewer batters than he walked should have raised a red flag, then his average fastball velocity decreasing from 92.2 to 90.5 should have raised an entire red tarp. While I was pre-occupied with the results of the game, the Phillies must have noticed, because on April 24, Nola was placed on the 10 day DL (retroactive to April 21) with lower back soreness. There is hope that he will only miss a start or two, but it’s worrisome for a young pitcher who’s trying to put his injury history in the rear view mirror. Game 16: Win, 4-3. I absolutely love Bartolo Colon. He is nearly 44 years old and looks less like an athlete and more like a man pushing the boundaries of the definition of “dad bod”. He throws his 89 MPH fastball almost 8 out of every 9 pitches. Yet he manages to not just survive in this league, but thrive in it. Say what you will about Syndergaard or Kershaw – there isn’t a single more amazing pitcher in baseball than Colon. I can say all this because the Phillies beat him, with Cesar Hernandez and his three hits leading the way. Don’t look now, but Hector Neris is 2 for 2 in save opportunities. Could the Phillies have finally found their man? Game 17: Win, 4-3. Picture this. You are Pete Mackanin. First off – nice glasses. They work for you. Next – The Phillies are up 2-1 in a hard fought game against the Braves. You are a mere 3 outs from another victory. Four members of the bullpen have pitched in save opportunities. Three of those pitchers have also blown saves. Do you go with the pitcher who has yet to blow a save, or put someone else in, committing to being non-committal about the closer? Oh. Edubray Ramos? You chose…poorly. Ramos struck out the side but sandwiched in between those K’s was a Brandon Phillips home run that tied the game. Okay. Let’s try this again. Mr. Mackanin! Tie game in extras. Pretty high leverage situation! I have an idea for who would fit in her-…. You know? Great. Okay, I’ll tell Hec-…oh? Oh. Stop shaking your head so hard, you’re going to give yourself a headache again. Yeah, sure. Jeanmar is cool. He’s done a very good job of finishing games this year, you’re right. Aw nuts. There he goes again, letting a run score. That Jeanmar…hm. Our offense is starting to do something…and Franco…WHAT?! 2 run single! Did you….ha ha, you knew what you were doing all along, didn’t you, Pete? Game 18: Win, 5-2. It was the Phanatic’s birthday, did you have any doubts? Eflin pitched 7 innings and walked nobody. It’d be easy to once again point at the small number of strike outs and fret, but in the games he’s piched he has done a good job at keeping hitters off balance. Statcast is a new technology MLB uses to measure every aspect of games. One thing it does is track the exit velocity and launch angle of batted balls. Using these two measurements in tandem, you can calculate a batted ball’s chances of landing for a hit based on the outcomes for similar batted balls. This is called expected batting average (xBA). The average xBA Eflin has allowed is 0.216, second among the team’s starters. (For those that are a little skeptical, xBA passes the eye test – highest xBA’s of the team belong to Morgan, Gomez, and Buchholz. The lowest xBA’s belong to Neshek, Benoit, and Eickhoff)Good pitching gets you halfway there. The other half is scoring runs, and the Phillies brought it in the bottom of the 8th. With the game knotted at 1, the Phanatic waved his magic wand over the bats, reminding them of the birthday they were there to celebrate. A double. A home run. A home run. A home run. Just like that, the Phillies were ahead, and ahead for good. Neris closed out the game (non-save situation), and the Phanatic Birthday magic once again added a tally to the win column. 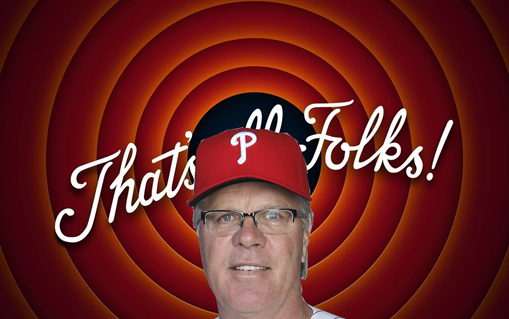 The Phillies are .500 once again. They are playing well. They are (for the most part) fun to watch. That is all I could ask for. Tomorrow, Vinny V goes for the win to put the team above .500 for the first time since opening day. Let’s Go Phils.